David Hanlon first came to the Pacific in 1970 with the Peace Corps. He and his wife Kathy served on the island of Pohnpei until 1973 as English language teachers in the village of Wone. They returned to the island in 1977 and taught at the Community College of Micronesia in Kolonia Town until 1980. While on island, Dr. Hanlon served as an advisor to the local historic preservation program and conducted an archaeological inventory of historic properties in the greater Kolonia area. He holds an MA degree in international relations from the Johns Hopkins University’s School of Advanced International Studies and a doctorate in Pacific Islands history from the University of Hawaiʻi at Mānoa. 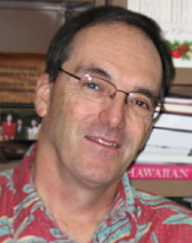 David Hanlon is the author of the award-winning book Upon a Stone Altar: A History of the Island of Pohnpei to 1890 and Remaking Micronesia: Discourses Over Development in a Pacific Territory, 1944-1982. He is also co-editor with Geoff White of Voyaging Through the Contemporary Pacfic. Dr. Hanlon was one of the founders of The Contemporary Pacific: A Journal of Island Affairs, and served as its editor for seven years before becoming editor of the Pacific Islands Monograph Series. He also sat on the editorial board of the Journal of Pacific History for more than a decade, and continues as a member of the editorial board of the University of Hawai`i Press. His research interests include Micronesia, missionization, development, Pacific historiography, and cross-cultural encounters. He maintains a strong commitment to graduate education and to mentoring students from the Pacific Islands region, and has been honored twice by the university as the recipient of the UH Presidential and Board of Regents awards for excellence in teaching. He succeeded Robert C. Kiste as director of the UHM Center for Pacific Islands Studies in August of 2002. Dr. Hanlon returned to the Department of History in August of 2008 at the completion of his second three-year term as director of the center. He was a visiting professor for the fall 2009 semester at Kagoshima University’s Research Center for the Pacific Islands; spent July of 2010 as a visiting international colleague at the Australian National University’s College of Asia and the Pacific; and from 2008 through 2012 was an active member of the Pacific Alternatives Research Project based at the University of Bergen in Norway. His most recent book-length publication is a biography of Tosiwo Nakayma, the first president of the Federated States of Micronesia. Dr. Hanlon retired from the university in August of 2018 but continues to serve on graduate student committees and several editorial boards. 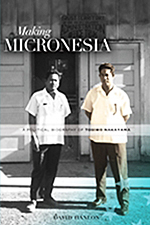 2014 Making Micronesia: A Political Biography of Tosiwo Nakayama. Honolulu: University of Hawaiʻi Press. 2000 Voyaging Through the Contemporary Pacific, co-edited with Geoffrey M White. Lanham, MD: Rowman & Littlefield. 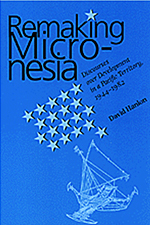 1998 Remaking Micronesia: Discourses Over Development in a Pacific Territory, 1944-1982. Honolulu: University of Hawaiʻi Press. 1981 From Mesenieng to Kolonia: An Archaeological Survey of Historic Kolonia. Micronesian Archaeological Survey Report 5. Saipan: Trust Territory Government Press. In Press “Manifestly Facing West: A History of the U.S. in the Pacific from 1784 to Present Times.” The Cambridge History of the Pacific, vol. 2. Anne Perez Hattori, Jane Sansom, Ryan Jones, Paul D’Arcy, and Matt Matsuda, eds. Cambridge, UK: Cambridge University Press. 2018 “L(o)osing Tere: An Obituary for Teresia K. Teaiwa,” Journal of Pacific History (53:1), pp. 90-96. 2018 “A Different Historiography for ‘A Handful of Chickpeas Flung Over the Sea:’ Approaching the Federated States of Micronesia’s Deeper Past.” In Warwick Anderson, Miranda Johnson, and Barbara Brookes, eds., Pacific Futures: Past and Present. Honolulu: University of Hawai`i Press, pp. 81-104. 2017 “Losing Oceania to the Pacific and the World.” The Contemporary Pacific, 29:2, pp. 286-318. 2015 “Space Wars: Nan Madol as Cultural and Political Property.” In Edvard Hviding and Geoffrey M. White, eds., Pacific Alternatives: Cultural Heritage and Political Innovation in Oceania. London: Sean Kingston Publishing, pp. 46-69. 2012 “Nan Madol on Pohnpei: the Future of Its Past,” in Edvard Hviding and Knut M. Rio, eds., Made in Oceania Social Movements, Cultural Heritage, and the State in the Pacific. London: Sean Kingston Publishing, pp. 121-140. 2011 “Histories of the Before: Lelu, Nan Madol, and Deep Time,” in Elfriede Hermann, ed., Changing Contexts, Shifting Meanings” Transformations of Cultural Traditions in Oceania, pp. 41-55. 2010 “Aloha for Their Violence: Locating the NFL’s Pro Bowl within Contemporary Hawaiʻi and the Deeper Hawaiian Past, South Pacific Studies, 31:1, pp. 1-16. 2009 “Gofors Sometimes Need to Be Got for, Too,” in Remembering Greg Dening. The Contemporary Pacific, 21:2, 299-301, 305-308. 2009 “The Sea of Little Lands: Examining Micronesia’s Place in Pacific Studies,” The Contemporary Pacific, 21:1, 91-110. 2008 “‘You Did What, Mr. President!’ Trying to Write a Life History of Tosiwo Nakayama,” in Telling Pacific Lives: Prisms of Process, Brij V. Lal and Vicki Luker, eds., 165-176, Canberra: Australian National University E-Press. 2005 “On Francis X. Hezel’s The First Taint of Civilization.” In Texts and Contexts: Reflections in Pacific Islands Historiography, edited by Doug Munro and Brij V Lal, 202-212. Honolulu: University of Hawaiʻi Press. 2004 “Wone Sohte Lohdi: History and Place on Pohnpei.” In Pacific Places, Pacific Histories: Essays in Honor of Robert C. Kiste, edited by Brij V Lal, 195-215. Honolulu: University of Hawaiʻi Press. 2003 “Beyond the English Method of Tattooing: Decentering the Practice of History in Oceania.” In Back to the Future: Decolonizing Pacific Studies, edited by Vilsoni Hereniko and Terence Wesley-Smith. 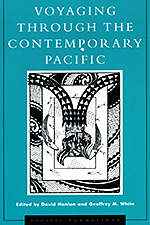 Special issue of The Contemporary Pacific 15:19-40. 2001 “Converting Pasts and Presents: Reflections on Histories of Missionary Enterprises in the Pacific.” In Pacific Lives, Pacific Places: Changing Boundaries in Pacific History, edited by Brij V Lal and Peter Hempenstall, 143-154. Canberra: Coombs Academic Publishing. 2000 Introduction (with Geoffrey M White). In Voyaging Through the Contemporary Pacific, edited by David Hanlon and Geoffrey M White, 1-22. Lanham, MD: Rowman & Littlefield Publishers. 1999 “The Chill of History: The Experience, Emotion and Changing Politics of Archival Research in the Pacific,” Archives and Manuscripts: The Journal of the Australian Society of Archivists 27 (1): 8-21. 1999 “Magellan’s Chroniclers? American Anthropology’s History in Micronesia.” In American Anthropology and Micronesia, edited by Robert C Kiste and Mac Marshall, 53-79. Honolulu: University of Hawaiʻi Press. 1995 “The End of History for the Edge of Paradise: Economic Development and the Compacts of Free Association in American Micronesia.” In Colonial Inheritance: The Pacific Islands Since Independence, edited by Brij V Lal and Hank Nelson, 83-93. Brisbane: Pacific History Association. 1994 “Patterns of Colonialism in Micronesia to 1942.” In The History of the Pacific Islands in the Twentieth Century, edited by Kerry R Howe, Brij V Lal, and Robert C Kiste, 93-118. Honolulu: University of Hawaiʻi Press; Auckland: Allen & Unwin. 1994 “Remaking Micronesia: A Reflection on the Cultural and Strategic Politics of Economic Development in American Micronesia, 1945-1968.” In Dangerous Liaisons: A Festschrift for Greg Dening, edited by Donna Merwick, 135-156. Melbourne: Melbourne University Press. 1993 “Sorcery, ‘Savage Memories,’ and the Edge of Commensurability for History in the Pacific.” In Pacific Islands History: Journeys and Transformations, edited by Brij V Lal, 107-128. Canberra: The Journal of Pacific History. 1993 Editor’s Introduction. The Contemporary Pacific 5: vii-ix. 1992 “The Path Back to Pohnsakar: Luelen Bernart, His Book, and the Practice of History on Pohnpei.” Isla: A Journal of Micronesian Studies 1 (1): 13-36. 1990 “The Pleasure of Speculation and Conjecture: Early Euro-American Visions of Nan Madol and Their Relevance to Post-Modern Archaeological Investigations.” In Recent Advances in Micronesian Archaeology: Proceedings of the Micronesian Archaeology Conference held on Guam from September 9-12, 1987, edited by Rosalind L Hunter-Anderson, 99-116. Special issue of Micronesica, Supplement 2 (October). Mangilao, Guam: University of Guam Press. 1989 “Micronesia: Writing and Rewriting the Histories of a Nonentity.” Pacific Studies 12 (2): 1-21. 1988 “The Federated States of Micronesia: Unifying the Remnants (with William Eperiam).” In Politics in Micronesia, vol 3, Politics of the Pacific Islands, edited by Ron Crocombe and Ahmed Ali, 85-106. Revised edition. Suva, Fiji: Institute of Pacific Studies, University of the South Pacific. 1988 “Another Side of Henry Nanpei.” Journal of Pacific History 23 (1): 36-51. 1984 “God vs. Gods: The First Years of the Micronesian Mission on Ponape, 1852 to 1859.” Journal of Pacific History 19 (1): 41-59. 1983 “Introduction to Recent Soviet Works on the Pacific.” Soviet Studies in History 21 (4): 5-13. 1983 “The Federated States of Micronesia: Unifying the Remnants (with William Eperiam).” In Politics in Micronesia, vol 3, Politics in the Pacific Islands, edited by Ron Crocombe and Ahmed Ali, 81-99. Suva, Fiji: Institute of Pacific Studies, University of the South Pacific. 1982 “Myths, Strategies and Guilt in Micronesia.” Perspectives [East-West Center, Honolulu] Summer: 24-27.